Services for William Trevor McCoy, 50 of Gans, Oklahoma will be held at 1:00 pm on Friday, April 5, 2019 at Agent Mallory Martin Chapel in Sallisaw, OK. Burial will follow at Sallisaw City Cemetery in Sallisaw, OK with the Reverend William Peters officiating. Trevor was born on March 13, 1969 in Grand Junction, Colorado to Twyla Jean (Thomas) McCoy and G. Paul McCoy. He passed away on March 31, 2019. He was married to Randi Lynn (Stipes) McCoy on November 22, 2001 at Central Schools. Trevor most recently worked as a maintenance man for the Cherokee Nation Casino in Sallisaw, OK. Trevor began his professional trade as a construction worker and drywaller, as a young man at the age of 15, when he followed in his father’s hard working footsteps. He was very talented and skilled in carpentry and cabinet work. Trevor loved all genres of music and started learning to play the drums as a teenager while living in the Dallas, TX area. He had a few basic lessons, but was, for the most part, self taught. 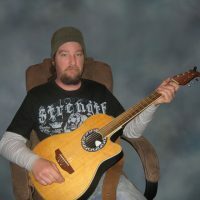 Trevor also played the bass and acoustic guitar. He made quite an impression on several area musicians who knew him. Trevor enjoyed playing various gigs with multiple area bands over the years. Most of all, Trevor loved his family and spending time with them. Taking them fishing and camping was a favorite past time. numerous nieces, nephews and many other relatives and friends. Honorary Pallbearers will be Anthony Hess, Drake Hess, Michael Maxwell and Darrell Reynolds.